A while I go I was at the old cemetery in Helsingborg (Sweden) uploading photos to Billiongraves.com. Walking around I often wonder about the people and about thier lives. Many of them passed away more that 100 years ago. 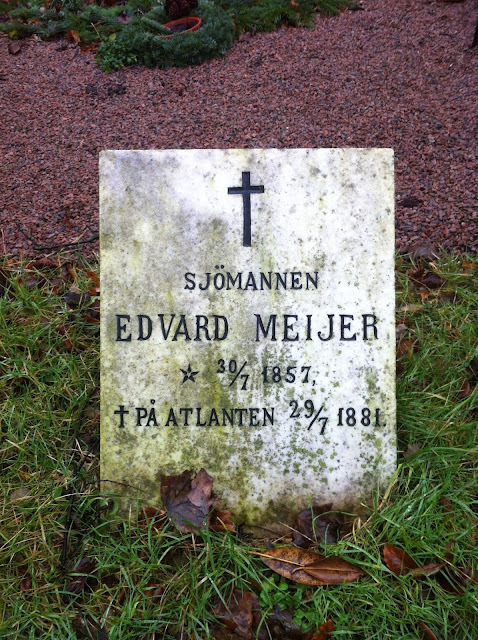 Today I picked sailor Edvard Meijers’ tombstone. Edvard August Ferdinand Meijer was born in Helsingborg (Sweden) July 30 in 1857. His father was brewer F A Meijer and his mother Carolina Marie Rolfes. The tombstone says Sailor Edvard Meijer, born July 30 1857. Dead on the Atlantic Ocean July 27 1881. He died (drowed) one day before his 24th birthday. I tried to find out more by searching some old newspaper to see if I could find out what happened but no luck this time. Below is from the birth book. Edvards father, died in 1860. 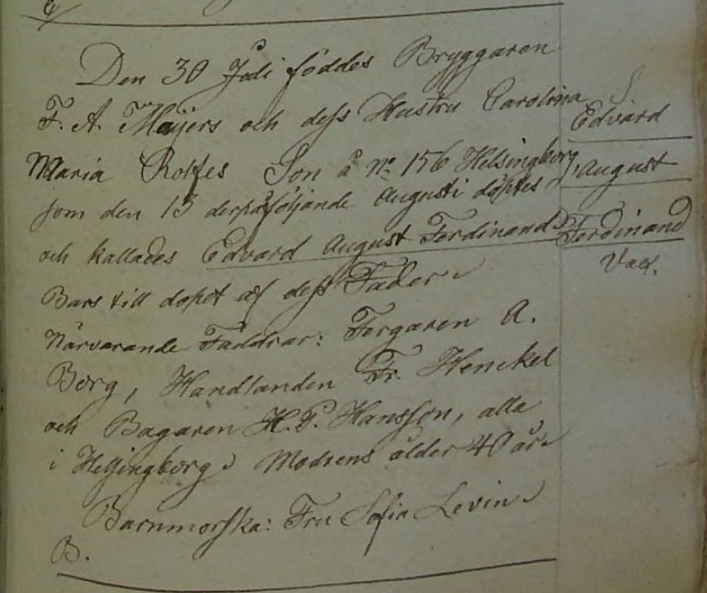 In 1861 Carolina remarried with a man called Johan Fredrik Granlund. He died only four years later, in 1865. Looking through the deathbook I didnt find any record of him in July. Instead he is one of the last posts in 1881. Edvard and his family is not related to me. Thanks for uploading pictures to BillionGraves.com and thanks for this story! Very interesting! Thanks. I love how easy it is to use the billiongraves app and that the photos gets geotagged. I also enjoy taking an hour or three to research a stone that seems interesting. I always learn something new doing that and its great way to take a break from my own research.